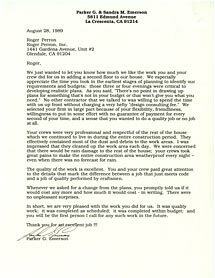 Emerson » Roger Perron Inc.
We just wanted to let you know how much we like the work you and your crew did for us in adding a second floor to our house. We especially appreciate the time you took in the earliest stages of planning to identify our requirements and budgets; those three or four evenings were critical to developing realistic plans. As you said, “There’s no point in drawing up plans for something that’s not in your budget or that won’t give you what you need.” No other contractor that we talked to was willing to spend the time with us up front without charging a very hefty “design consulting fee.” We selected your firm in large part because of your flexibility, friendliness, willingness to put in some effort with no guarantee of payment for every second of your time, and a sense that you wanted to do a quality job or not job at all. Your crews were very professional and respectful of the rest of the house which we continued to live in during the entire construction period. They effectively contained most of the dust and debris to the work areas. I was impressed that they cleaned up the work area each day. We were concerned that there would be rain damage to the rest of the house; your crews took great pains to make the entire construction area weatherproof every night – even when there was no forecast for rain. The quality of the work is excellent. You and your crew paid great attention to the details that mark the difference between a job that just meets code and a job of quality performed by craftsmen. Whenever we asked for a change from the plans, you promptly told us if it would cost any more and how much it would cost–in writing. There were no unpleasant surprises. In short, we are very pleased with the work you did for us. It was quality work; it was completed as scheduled; it was completed within budget; and you will be the first person I call for any such work in the future. Thank you for an excellent job!! !